My first contact with paletas as an adult was through a local chain called Locopops. They make an assortment of very tasty ice pops in flavors aimed at the high-end palate like Lavender Cream and Pomegranate-Tangerine, as well as some more traditional ones like Mango-Chile. As with most interesting businesses, their hours are weird and their stores are strange spartan holes in the wall. In their Chapel Hill location, the only chairs and tables are designed for small children so you have to crouch while eating your locopop, staring at walls covered in a bizarre assortment of customer crayon art. The signature on a drawing often reads something like “Tim, Age 22”, but usually the locopop makes it okay. I like them a lot. 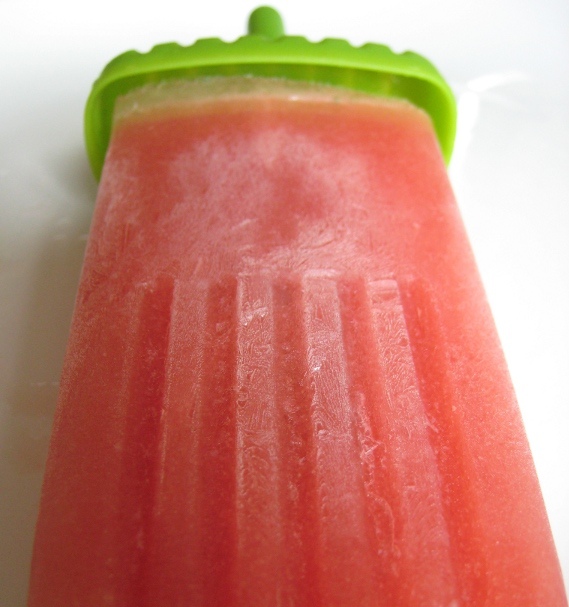 The picture above was my first attempt at making a Watermelon-Cucumber paleta, a flavor I first tried at Locopops and then all but ran home to replicate. It’s delicious and thirst-quenching, but it’s also a pretty good example of the basic paleta recipe. It’s so simple it’s almost not worth posting, but I couldn’t find it online anywhere so in the tradition of “If you look for something on the net and don”t find it, put it there.” I’ll include it here. Quantities are really rough, dependent on the quality and water content of your watermelon and cucumber. Whatever leftovers you have will taste good over ice or with a splash of vodka. Start your blender and begin tossing chunks of watermelon into the blades to get a decent slurry going. Once all the watermelon is blended, add the cucumber chunks and blend for longer than seems necessary, 2-3 minutes at minimum. The more you pulp it down, the better the texture of the paleta. Add the lime juice and vodka (if using) and blend to combine. Taste the result for sweetness; supermarket watermelons are rarely sufficiently sweet but a good one from a farmer’s market probably won’t need a lot of extra sugar. Add sugar a bit at a time, blending and tasting after each addition. The sweetness will be blunted by the cold once its frozen so you want the mix to be slightly sweeter than you want in the finished paleta. Using a mesh sieve, strain the mix over a bowl to remove as much of the solids as you can. If you’ve blended sufficiently there shouldn’t be a huge amount. Chilling the mixture for 1-2 hours is optional; I’m told by being cold already when going into the deep-freeze, the paletas will freeze faster and the ice crystals will be smaller. It also provides some time for the air beaten into the mix by the blender to percolate out. I usually throw my empty paleta molds into the freezer at the same time so they’re cold as well. In the end though, we’re really not that far off from ice cube trays and Hawaiian Punch here, so do as much or as little as you feel like; the results will still taste good. Fill your paletas molds, leaving room for the mixture to expand when freezing. Tovolo makes several different sets with their own stands for about $12 apiece; they’re available at Amazon.com. Alternatively, you can use paper cups, adding popsicle sticks before the mix freezes hard. Freeze for at least four hours, preferably overnight. To remove, run the molds under a lukewarm faucet. Eat before they melt. That’s about it and it works for almost any flavor you’d like to try. Take fruit, blend until smooth, run the result through a sieve for texture, and then add sweet or sour as necessary until it tastes good to you. Lemon/lime juice and sugar work fine. Lowfat vanilla yogurt makes an excellent base for various kinds of paletas de crema; banana and peach have both come out extremely well. The real charm of paletas is in their ease and economy. A batch can be whipped up in minutes and within four or five hours, you’ve got a one-handed cold treat in which you’ve had full control of the fat, sugar, salt, or whatever other diet parameters you’re trying to twiddle. They’re also a terrific laboratory for experimenting with new flavors if you’re into making your own ice creams. A test batch poured into a set of paletas molds while your ice cream maker bowl is freezing would go a long way toward letting you know there’s going to be a problem with that squid sorbet.